Jabari Brown (SG, 6’3″ ,2011) has offers from ACC schools including Maryland and Wake Forest. His list of offers also includes ASU, Cal, UNLV, & New Mexico. He is interested in Kansas as well, who is keeping up with Brown, although reportedly not offered yet. Ryan Rhoomes (C, 6’8″, 2010) is probably headed to prep school but has recruiting interest from Georgia Tech, who recently missed out on big man transfer Justin Knox. Terry Whisnant (SG, 6’3″, 2011) has committed to Florida State. The Seminoles have landed a sharpshooter with a high release from the state of North Carolina, one of the best jump shooters in the class. He will need to prove he can put the ball on the floor, but without question teams are going to have to close out on him on the perimeter. Ryan Arcidiancono (PG, 6’3″, 2012) garnered a ton of interest at the 2010 Bob Gibbons Tournament of Champions this past weekend and has interest from Wake Forest, as well as Notre Dame, Syracuse, Villanova and Penn State. The North Carolina Tar Heels post depth got a little relief yesterday as Justin Knox, the 6’9″ senior transfer from Alabama, decided to play his final year of eligibility in Chapel Hill next season. Knox chose UNC after considering several options, including Georgia Tech. There were stipulations in his transfer from Alabama that prevented him from choosing schools in the SEC or in the state of Alabama, eliminating many schools that would have been viable options. However, Knox and his family were excited to join the North Carolina program and are looking forward to next season. With the lack of big men on the UNC roster, Knox has a good shot at extended playing time. Make no mistake about it, college basketball is big business. Recently I was discussing the quest for 2010 big men on the campuses of Kentucky and North Carolina with some fans from both schools. The reason both schools are working so hard to line up big men for the 2010 year isn’t because they can’t find players. These two schools are so nationally recognized that they have thousands of big men who would bolt to their program if given the opportunity. In addition to being on a national power, the teams play nearly all of their games on national television, with massive fan bases. Both schools’ basketball programs have a deep reach into pro basketball, which means that players that attend those schools will make connections with coaches, players, scouts and ex-players who can help them land a big paycheck in the future, even if it’s not playing on a roster. But both schools can’t take just any post player. They need power players, players who are good enough to help them maintain their status as a national force. This is because for big time college basketball, it’s not just about winning, it’s about money. As a result, college basketball recruiting is a huge piece of the business of college basketball, and has been a cottage industry for some time. There are scouting services and websites that have proliferated over the past few years. Traditional media and scouting services hate, absolutely hate, the sudden infusion of new people into what used to be their own domain. They sneer at the concept of ‘fan’ websites following high school recruiting and claim that it’s all amateur. This, despite the fact that many new services are run by coaches, journalists or ex-players. On one hand, the criticism is correct. There is an issue already in high school basketball recruiting where independent people can inject themselves into the recruiting process where college coaches can’t. Traditional newspapers will complain that anyone can start a website, obtain media credentials and get right next to highly sought after recruits. This is a straw man argument, however, because ‘anyone’ can start a newspaper, ‘anyone’ can start a newsletter, and there is no difference between a media outlet which is a printed paper circulating to 10,000 people and a website with 10,000 unique readers. The only difference between any of these media outlets is management and integrity. Claiming that somehow printed scouting services or newspapers are any more legitimate just because of the method of distribution is a hollow argument. I would point to examples such as the New York Post and other methods of yellow journalism that pervade printed, established media to illustrate that the legitimacy of a media outlet is completely dependent on the ethics of the publisher, and nothing else. It’s quite easy today to pick up any newspaper and find a story with poor or non-existent source attribution, laden with opinionated bias represented as fact, and in many cases, outright interpretation of the facts. Irresponsible journalism is rampant across printed media, television media and the radio airwaves, so the idea that these legacy media outlet have any credibility in pointing out who is a legitimate news source is a farce. Are there people injecting themselves irresponsibly into the world of college basketball recruiting? Absolutely. But it’s not limited to online publishing. One specific item is how there is so much focus on ‘ranking’ players in a particular class. I must preface the following by mentioning that many colleagues who I respect and who have contributed at one time or another to our sites run ranking services and publications. They work hard to produce accurate representations of the talent levels in a given class. But I have always maintained that our site’s focus was on actual scouting and following the players. Ranking a player as number 10 in his class is not the same as discussing how a specific player will fit in at a certain program or what that player’s specific abilities are. Rankings are fun for the fans, and they have their place. But for us, we are more focused on strategy, contribution and long term prospects. The perfect example is a 6’8″ post player who can rebound like mad but doesn’t score much. He’s incredibly valuable to a team with scorers on the wings, but in a ranking system he’s likely a dud. This is not to take rankings to task. I mention the concept of rankings merely to point out that rankings were created by established, printed media, decades ago, in almost all cases by people who had never coached or played basketball at any level. In other words, exactly the way that those same media outlets complain about the ‘new media’ today. The difference is now there is far more scrutiny. For us, our sites have contributions from journalists, players, ex-players and coaches. Some of our contributors have worked for or played for NBA teams, some for Division I programs. So while we constantly hear the ‘old media’ complaining about our new media, we can’t help but wonder who decided they were the experts. Kadeem Jack, the 6’9″ post player from the class of 2010 has gone from being a player who was sort of off the radar to being front in center over the past few weeks, as chronicled here. Thanks again to ScoutsFocus, who provided a nice interview a few days ago with Jack and his thoughts regarding UNC, Kentucky, Miami and Arizona and where he might end up. While the clip is short, it shows the one thing that I love when I watch a big man play at any level: timing. Timing can’t be taught, and timing is the basis for so many important skills: rebounding, shot blocking, putbacks and catches on the run. Now, this small clip doesn’t automatically put Jack into Dennis Rodman territory, but it’s a nice little slice of what I’ve seen from him before. 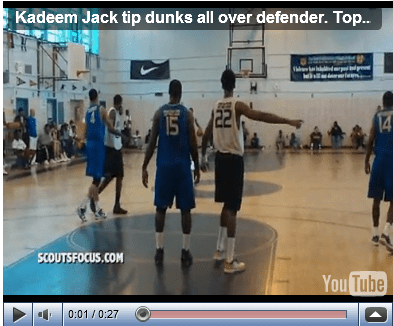 A shout out to ScoutsFocus.com for sending us this interview with Kadeem Jack, the 6’9″ post player that has suddenly shown up on several teams’ radar due to the lack of post players still remaining in the 2010 class. Kadeem certainly is giving the fans of the schools he’s considering a lot of great reasons to like him. He talks about trying to do intangible things like working hard, putting full effort on the court, and getting better. With so many top schools interested in him, it’s great to see that he’s grounded and comes across as a young man who understands how to put his best foot forward at all times. Wake Forest’s new head coach, Jeff Bzdelik, found his first order of business to secure the existing recruits with the help of his assistant coaches. His second need was to get out on the recruiting trail and keep bringing in talent so he can compete in the ACC. His first recruit is Chase Fischer (SG, 6’3″, 2011), a player who averaged 32.1 ppg last season, had originally committed to Marshall, but later de-committed after a coaching change. A visit to Wake Forest convinced Fischer to head to Winston-Salem for his college career. It’s no secret that the North Carolina Tar Heels need post players. Given the scramble for remaining 2010 post players that has erupted over the past few weeks, any option of a viable big man will be something the UNC staff will consider. 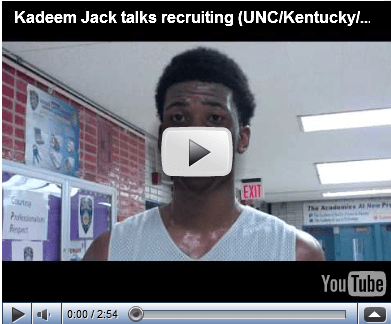 While names like Kadeem Jack (C, 6’9″, 2010) have suddenly become common to UNC fans, two players that UNC wanted to consider will not be available. Bill Cole of the Winston-Salem Journal reports that Marcus Thornton, a 6’7″ power forward who originally committed to Clemson, and Kevin Noreen, a 6’11’ PF/C who committed to Boston College, both signed national letters of intent Last November with their original ACC commitments. In both cases, coaching changes are the reason the players were granted a release. The ACC has compliance issues with players who transfer from or are committed to ACC schools, going to another ACC school. UNC has contacted the high school coaches of both players. The rule is that transfers from one ACC school to another will lose a full year of eligibility. That means that if either player chose to play at UNC, they’d have to sit out a year, but going to any non-ACC school would mean they could play right away and keep their four years of eligibility. This also affects Georgia Tech and Virginia, both of whom have extended scholarship offers to Thornton. ACC schools can appeal the ruling, but in recent cases, the ACC hasn’t allowed a deviation regardless of whether the player has actually played for the school or not. You are currently browsing the ACC Basketball Recruiting blog archives for May, 2010.